Evolution is continuing for the Nissan GT-R.
Nissan's iconic sports car brings a refreshed vision of "innovation that excites" with the 2014 model offering a new level of sophistication, yet no compromise with the performance. 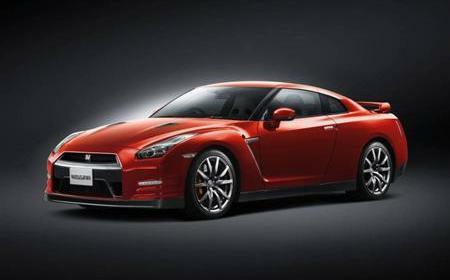 The 2014 Nissan GT-R begins sales in Japan on 2nd December, followed by sales worldwide. Outstanding performance meets a new level of sophistication. With outstanding adhesion from its tyres, the GT-R is capable of stunning confident acceleration and braking performance. More constant tyre contact is achieved by optimised electronic control of the shock-absorber valves, as well as modified front stabiliser spring rates and updated bush link. The tuning of these parts, which makes best use of the suspension strokes and enhances road-holding capability, gives a poised, confident ride and outstanding traction on rough roads. The upgraded GT-R is now fitted as standard with Dunlop SP Sport Maxx GT 600 DSST CTT tyres, for outstanding road-holding and precise response in all conditions thanks to stiffer sidewalls which reduce deformation, improving steering response under hard cornering. At the front, their specification is: 255/40ZRF20(97Y) and at the rear: 285/35ZRF20(100Y). The GT-R's steering has been fine-tuned to reduce the effort required for in-town manoeuvres, while maintaining its exceptional feedback during high-speed driving. The combination of retuned suspension and exceptional steering feel give outstanding confidence at high speed. The 2014 Nissan GT-R maintains its position as one of the most striking super cars in the market. Significant updates to the Nissan GT-R's lights both enhance the visual impact of the car. Customers looking for added visual impact now have a wider colour palette to choose from. The 2014 Nissan GT-R sports new efficient, high-intensity, multi-LED headlights that provide a distinctive "lightning" motif, generating a striking exterior visual signature. With such a unique visual reference, the GT-R's road presence is enhanced, particularly in low-light and at night - while the fitment of the new headlights gives the driver increased visibility. The new headlights feature AFS (Adaptive Front lighting System - not available in all markets) that automatically adapts the angle of the light beam according to the speed of the car. At highway speeds, actuators in the headlight unit adjust the angle of the projectors to project the light further. The four LED units are configured with new intensive LED hi-beam and three different LED low-beams including long-distance-illumination and wide-illumination. Upon start up, the full new lighting signature is illuminated, providing a dramatic start-up procedure. Visual appeal is reinforced with the addition of a new body colour called Gold Flake Red Pearl. As its name suggests, there are microscopic gold-tinted glass flakes infused into the red paint, making a spectacular effect in the deep, lustrous paint as the light catches the finish. To achieve the project's ambitious targets for high-speed handling and ride comfort, Nissan enhanced the level of precision-constructed body elements and advanced assembly methods to make the 2014 Nissan GT-R.
Each part is made of materials selected for optimum performance: Precision-constructed, multi-material hybrid body combines steel, carbon fibre and die-cast aluminium to achieve high stiffness and light weight. Thanks to the rigidity of the GT-R's body construction, suspension precision is guaranteed while refinement is enhanced, resulting in exceptional cabin refinement even at high speeds and under hard cornering.